In a small Michigan beach town, an eccentric movie buff and a compulsive secret agent join forces to solve a case of kidnapping and murder. George Starling quit his job as a secret agent to take care of a traumatized woman he rescued. He has brought her home to her small Michigan town, where she can't seem to get better, and he can't seem to shake loose of his need to take care of her. When an old friend asks him to investigate a local lead in an international kidnapping, George reluctantly agrees to interview a witness. That witness is Karla Marquette, a flaky local movie buff who seems to have lost touch with reality. But George knows the instant he meets her that Karla has a genius for happiness. If he can only help Karla clear her friends of suspicion in this kidnapping and murder, perhaps she can help he and his girlfriend find the happiness that eludes them. But the case is deeper than it seems, and soon George finds himself, and even his girlfriend, entangled in a deceptive plot. Can he break loose, or will it be up to Karla to rescue them all? 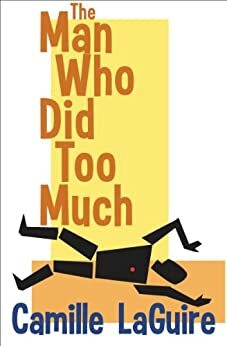 The Man Who Did Too Much is a 95,000 word novel which combines classic mystery elements with comic suspense. I have had this book on my reading list for some time and finally read it--and I'm sorry I waited so long. Love the protagonists, especially Karlie. I'm not big on spoilers and I'm not knowledgeable about the mystery genre(s) so I'm going to keep this brief and to the point. I really enjoyed this book. The characters were interesting, engaging and a bit eccentric while still being believable. The story moved along nicely and there were enough twists and turns to keep me constantly engaged. There was enough humor mixed in to keep things from getting overly heavy and enough substance to make figuring out what was going on a challenge. In a small town by the Michigan beach, a mystery is brewing. Ex-secret agent George Starling is looking after Gwen, a traumatized woman he rescued. His old life comes back when a friend asks him to investigate a case of international kidnapping. George reluctantly agrees to take part and talks to the witness, Karla Marquette, a movie buff who seems to be a genius for creating happiness. Karla wants George to help her clear the suspicion surrounding her friends. George agrees to help, in the hope that Karla can help George and Gwen find happiness. International kidnapping and intrigue.... With this forming the plot of The Man Who Did Too Much, I found this debut book in the Starling and Marquette Mystery series very interesting. While George and Gwen are interesting and likable characters, it was really Karla that I found the most intriguing. She comes across as flaky and out of touch with the world, and very eccentric. She's the kind of character that you don't forget in a hurry, and I love that. I really liked the mystery. I was on the edge of my seat watching George try to solve the mystery, while still intrigued by the back story with George and Gwen. The Man Who Did Too Much was a good debut and I definitely plan to read more books in this series.